With summer’s end quickly approaching, we are getting out in our boat as much as possible. That means less time stitching in my studio, but there will be time for that this fall and winter. I tend to be a compulsive worker, so I’m trying to bring more of a balance of work and family/social time into my life. 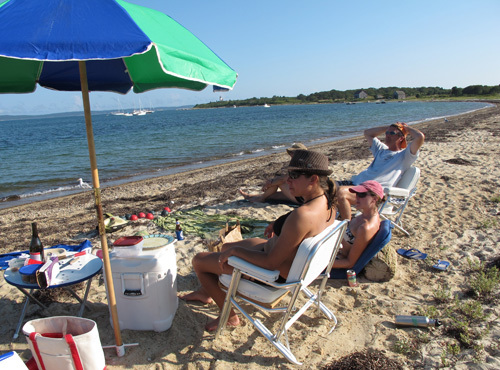 We motored down to Tarpaulin Cove, which is about a half hour boat ride from Woods Hole. 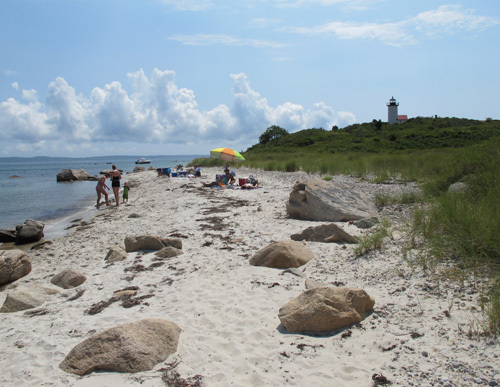 It’s one of the beaches that the public is allowed to use on Naushon Island, which is privately owned. But you can only get to these beaches by sea. The family trust that owns this stretch of islands keeps them undeveloped and natural, with just a few houses for family members to stay. It’s like going back in time a couple hundred years. 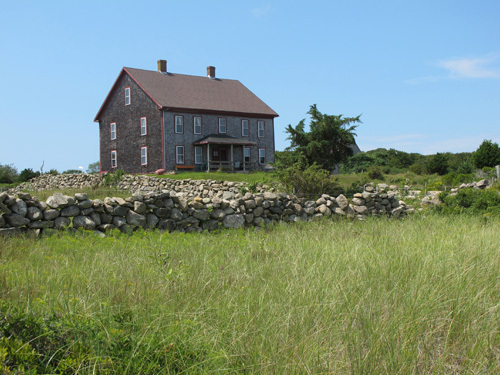 I walked with my friends down the beach toward the light house, passing the farm-house. We went through a stile, which keeps cattle from straying too far. 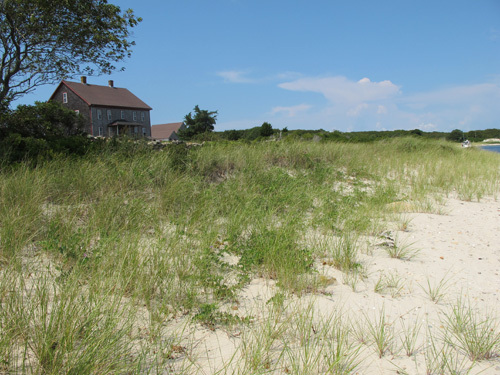 Their pasture is inland, over the dunes, with a path to the water. The last time we came to the cove, the cows were standing in the water, cooling off. We worked our way along the shore. And climbed up towards the light house. Where we could see across the sound, with Martha’s Vineyard in the distance. Looking out, I imagined all of the ships that have passed by this point or taken shelter in this cove. 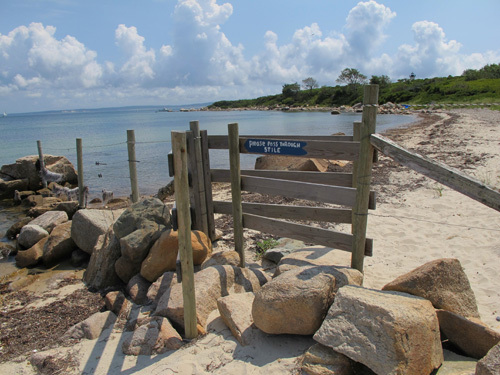 There’s a story about how during the Revolutionary War, British ships hid in Tarpaulin Cove, waiting to attack Cape Cod. 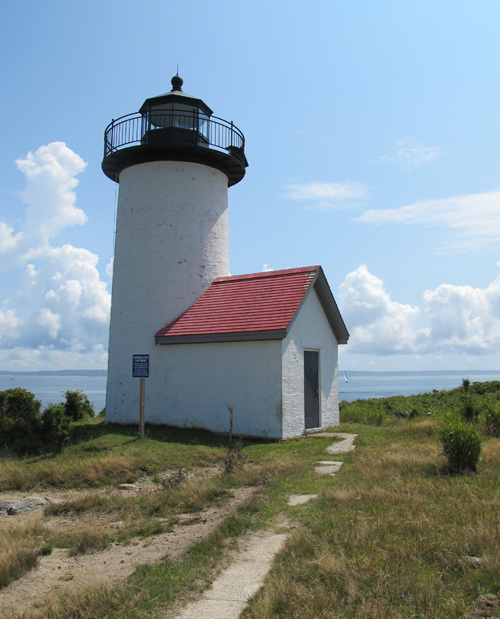 They were spied and word got back to the main land in time for the militia to defend the shores of Falmouth. 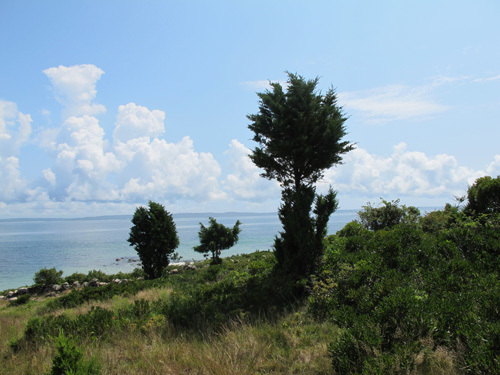 This entry was posted in Inspiration, Travel, Woods Hole by Salley Mavor. Bookmark the permalink. Thank you so much for sharing this beautiful spot! I am sure you chose the best – enjoy the nice time on the beautiful beach. this looks so pretty, i wish the weather was this balmy in the UK! Idyllic is the perfect word, Jane!! Wow, Shelley, what a treasure to be able to spend time with your family in such a place!! Oh, such a beautiful area! Enjoy, enjoy. Loved being able to see this little bit of heaven…what a joy for you and yours to be able to experience this protected and treasured island. Thank you so much for sharing it with us. You are so kind to let us in on many of your special places and moments. Blessings and gratitude to you! It’s as if you are telling a charming little story as you share the photos. What a delightful place to visit! Thanks for sharing. I am just reading Calebs Crossing by Geraldine Brooks which is set in this area. It’s nice to have a place to go with the book. Glad to hear you are taking some time with friends and family close to home. I feel lucky as I’m sure you do that we live in such a beautiful part of the country. Living in Texas, I get homesick for the northeast at times…thanks for sharing the pictures and your day! In the UK a stile is a wooden structure that you climb over. It usually goes over a stone wall or fence or through a hedge. Your picture shows what we call a kissing gate—–the first person through controls the gate and gets a kiss from their partner before allowing them through. Beautiful place. It’s really kind of the family to open up the beach to the public. I can’t imagine living there – seems idealic but probably inconvenient at times! Wow what a special place to relax and unwind. Good for the soul.